Schleicher County was home to the YFZ Ranch, the past headquarters of the FLDS movement headed by Warren Jeffs. Around 8000 BC, by estimation, the first inhabitants in the area were probably Jumano Indians. Later inhabitants were Lipan Apaches and Comanches. In 1632, Fray Juan de Salas and Father Juan de Ortega did missionary work among the Jumanos. Soldier Francisco Amangual led an expedition across the area in 1808. In 1882, Christopher Colombus Doty became the first permanent citizen of Schleicher County. 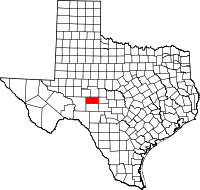 The Texas legislature established Schleicher County in April 1887 from Crockett County, and named it in honor of Gustav Schleicher. By 1890, the population was 155, of whom 134 were listed as white, four were Black, and 17 were American Indian. In 1894, the county’s first public school opened at Verand, and later moved to Eldorado. The next year, W. B. Silliman founded the Eldorado community and named it after the mythical city. To populate it, he offered free town lots to residents of nearby Verand. In 1930, the Panhandle and Santa Fe Railway Company resumed work on a previous railroad, making access possible to San Angelo and Sonora. On February 27, 1941, the West Texas Woolen Mills plant in Eldorado held a grand opening, with a parade and BBQ lunch. About 5000 people attended. Governor "Pappy" W. Lee O'Daniel was the guest speaker. Oilfield discoveries on school lands in the 1950s enabled Schleicher County to build new library and gymnasium facilities for its students. According to the U.S. Census Bureau, the county has a total area of 1,311 square miles (3,400 km2). As of the census of 2000, 2,935 people, 1,115 households, and 817 families resided in the county. The population density was about two people per square mile (1/km²). The 1,371 housing units averaged about one per square mile (<1/km²). The racial makeup of the county was 76.59% White, 1.53% African American, 0.07% Native American, 0.17% Asian, 0.03% Pacific Islander, 18.98% from other races, and 2.62% from two or more races. About 43.54% of the population was Hispanic or Latino of any race. Of the 1,115 households, 34.30% had children under the age of 18 living with them, 62.60% were married couples living together, 7.50% had a female householder with no husband present, and 26.70% were not families; 25.40% of all households were made up of individuals, and 12.80% had someone living alone who was 65 years of age or older. The average household size was 2.59 and the average family size was 3.12. In the county, the population was distributed as 27.90% under the age of 18, 7.30% from 18 to 24, 24.00% from 25 to 44, 24.40% from 45 to 64, and 16.40% who were 65 years of age or older. The median age was 39 years. For every 100 females, there were 98.80 males. For every 100 females age 18 and over, there were 94.90 males. The median income for a household in the county was $29,746, and for a family was $37,813. Males had a median income of $28,412 versus $22,250 for females. The per capita income for the county was $15,969. About 16.00% of families and 21.50% of the population were below the poverty line, including 29.00% of those under age 18 and 19.90% of those age 65 or over. ^ Lyman Wight's Mormon Colony in Texas excerpt from "Mormon Trails" chapter in Hill Country travel guide by Richard Zelade. Accessed August 6, 2007. ^ a b c d e f Smyrl, Vivian Elizabeth. "Schleicher County". Handbook of Texas Online. Texas State Historical Association. Retrieved 30 November 2010. ^ Kessell, John L (1995). Kiva, Cross, & Crown: The Pecos Indians and New Mexico, 1540-1840. Southwest Parks & Monuments Association. p. 142. ISBN 978-1-877856-56-3. ^ Kenner, Charles L (1994). The Comanchero Frontier: A History of New Mexican-Plains Indian Relations. University of Oklahoma Press. p. 57. ISBN 978-0-8061-2670-8. ^ "Christopher Columbus Doty". Texas Historical Markers. William Nienke, Sam Morrow. Retrieved 30 November 2010. ^ "Eldorado, Texas". Texas Escapes. Texas Escapes - Blueprints For Travel, LLC. Retrieved 30 November 2010. ^ "West Texas Woolen Mills". Texas Historical Markers. William Nienke, Sam Morrow. Retrieved 30 November 2010.